AMD finally makes its low-power hybrid CPU/GPU in a single die chip official, which is targeted at ultra- thin netbooks and notebooks. The new class Accelerated Processing Units (APUs) are offered in single-core C Series (Ontario) and the dual-core E Series (Zacate) version, they are made using 40nm process technology and feature x86 CPU core codenamed “Bobcat”, UVD3 DirectX11-capable graphics core and parallel processing engine, an integrated DDR3 memory controller, a dedicated high-definition video acceleration block, and a high-speed bus that speeds data across the differing types of processor cores within the design. The new integrated solutions promise stutter-free 1080p HD video playback, 2D conversion to 3D, DirectX 11-capable graphics, and “all-day battery life”, which according test means up to 10hrs. AMD also announced thate 32nm die A-Series “Llano” APU, which includes up to four x86 cores and a DirectX 11-capable discrete-level GPU, intended for performance and mainstream notebooks and desktops is scheduled to ship in the first half of 2011 and appear in products mid-year. 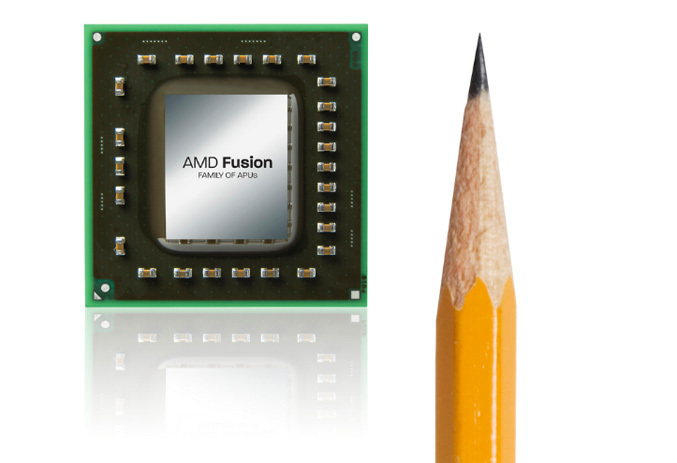 Leading manufacturers like Acer, Asus, Dell, Fujitsu, HP, Lenovo, MSI, Samsung, Sony and Toshiba plans to deliver new generations of desktop, notebook and HD netbooks based on AMD Fusion APUs.